Nepal cycas is often called "iron tree" among the folks. One reason is because the wood has a dense quality and may sink as soon as it is put into water, and this is one of the reasons it gets its name; the other reason is that its growth needs a lot of iron elements. Even when a Nepal cycas is going to die, so long as someone hammers nail into it, it would recover in no time. As a matter of fact, Nepal cycas does not refer to a specific plant, it is the name for a big family of plants. Nepal cycas is one of the oldest plants in the world and it once vied with the dinosaurs on the globe; therefore, it is called a "living fossil in plants" by the experts. Nepal cycas originated in the Permias Age, it began to bloom in the Trias Age, it entered the most flourishing period in Jurassic Age and it scattered almost in everywhere on earth at that time; by the time of the cretaceous period, because the prosperity of angiosperm plants, it began to decline. At the Quaternary Period, glaciers came; the cold snap invaded the South, Nepal cycas plants distinguished in huge amounts. However, since blocking of the Qinghai-Tibet Plateau and Mount Qingling, some Nepal cycas plants in Sichuan and Yunnan shaved the diaster. Currently, there are altogether 110 varieties of Nepal cycas plants in the world, and they are mainly scattered in tropical and subtropical areas in the Southern and Northern hemispheres. In China, there are about 10 varieties of Nepal cycas plants, and they mainly scatter in Yunnan, Canton, Fujian, Taiwan, Guizhou, Hunan and Hainan etc. The marrow cores of the Nepal cycas plants are rich in starch contents, and they can also be used for distilling of liquors, which can increase the output. The leaves of Nepal cycas plants are like feathers; they stretch out like peacocks in pride and are amazing to the eyes. The local folks in Xishuangbanna pick up young tree leaves as vegetables. The seeds of Nepal cycas plants are small, like the eggs of doves; but they are golden yellow and bright. Some times Nepal cycas have tens of seeds, and sometimes dozens of them. The seeds grow on the top of the trees and some people even call such scenes "peacocks hatching eggs". In Guizhou, the local farmers often braise the seeds with hog feet, which is quite a delicious dish. The Chinese uses the proverb "the time when the iron tree begin to abloom and when the mute begin to speak" to describe the hardness and slow proceeding of drastic changes in life; but, actually, this is not the fact, particularly in tropical areas. The Nepal cycas trees over 20 years abloom every year. The male and female plants are different plants, and their flowers are different too. The blooming period of Nepal cycas plants is from June to August; the male flowers are elliptical, and they stand upright amongst the featherlike leaves; the flower balls are brownish yellow, and look vital, energetic and dignified; the female flowers are oblate, and light yellow in color; they grow close to the top of the stalk, and look like quiet virgins are being suntan in the tropical and subtropical sunlight. 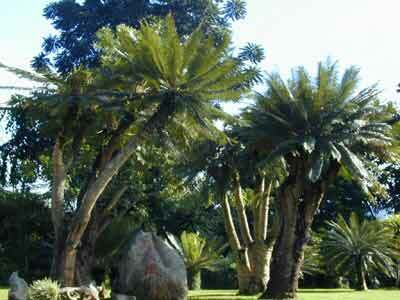 Within the Tropical Botanical Garden, there are three giant Nepal cycas trees, one male and two females. They are transplanted from wild state in the 1980s and are the oldest Nepal cycas trees ever discovered in Yunnan. Their ages are more than 1000 years and they are deemed as the "kings of Nepal cycas trees". Their academic name is Nepal cycas. For the time being, this kind of plant is nearly distinguished and is a Class II national protected plant.